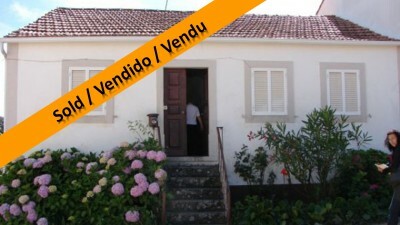 € 50.000,= / £ 43,235.= * A three bedroom semi-detached village house for sale near Alvaiazere in central Portugal. The property is set over two floors, though the lower ground floor is being used as a storage area at present. The main entrance to the cottage is accessed via a set of exterior stone stairs. The main entrance has a double opening, panelled wooden door and leads into a central hallway which runs the depth of the building. The hallway has a wooden floor and decorative wooden panelled ceiling. Off this hallway there is a living room, which has a wooden floor and decorative wooden panelled ceiling. there are three bedrooms, all of which are accessed off the central hallway and have traditional style double opening doors with glazed panels above. One of the bedrooms is double aspect and all have recessed windows with exterior Portuguese style shutters. The kitchen, which is triple aspect, is located at the rear of the house and has a sloping, wood covered ceiling. The kitchen is partially tiled and there is a range of built in base level wooden units with marble work surfaces. There is a fireplace within the kitchen and space for a dining area, though the current owners uses this part of the kitchen as a second, informal living room. Off the kitchen there is a bathroom, which is partially tiled, has a bath with shower above, toilet, bidet and vanity basin with storage cupboard beneath. The property also has a large attic room, which has a wooden beamed roof, though could be converted into additional living space if required. To the ground floor of the property there are two large storage rooms, which can be accessed via the side of the house or from the garden. These two rooms have concrete floors and wooden beamed roofs and could quite easily be converted into additional living accommodation if necessary. There is a semi-detached garage to one side of the house, which is spacious and could accommodate up to four vehicles. The garage has a vine making vat installed and a concrete floor. At the rear of the house within the garden there is a detached, single storey storage building. This building has been constructed in red brick and has a wooden beamed roof. The property’s garden measures approximately 700 square metres and is flat. There are a number of mature olive and fruit trees and the ground is fertile. There is a gated entrance at the rear of the house, which has ample hard standing parking. The property is situated in the heart of the hamlet of Aveleira and is a short drive from the towns of Cabaços and Alvaiazere. The town of Cabaços, which has several cafes, mini-market, weekly market, shops, pharmacy and health centre, is around five minutes drive. The town of Alvaiazere , which has supermarkets, shops, cafes, bars, restaurants, petrol station, health centre, sports centre, library and swimming pool, is around four kilometres from the property. The historic town of Tomar , which is famous for the UNESCO listed Convento do Cristo, is around 25 minutes drive by car from the farmhouse.